Footy can be telling. On Sunday afternoon, East Fremantle’s performance certainly told a story. With 15 wins, a minor premiership and a reputation as being virtually unbeatable on the line, season 2018 couldn’t have been any kinder to the Sharks. Come finals time in their semi-final against Peel Thunderbirds, the trend unquestionably continued. It was never a matter of East Fremantle finding their momentum, because they started with it from the very first bounce, and not once did they look back. On the flip side of the coin, it was another story for their opponents in Peel Thunderbirds, who exhibited a performance which was anything but a reflection of the consistent form they’ve shown throughout 2018. With opening goals to Ashlee Atkins and Belinda Smith, the Sharks wasted no time converting and making the most of their consistent entries inside 50. Add Jade De Melo’s strong leads, effective run and two goals to the first quarter tally, and the Sharks looked unstoppable. They went into the first break up 28 points. Matters only got worse for Peel in the second term. Electing to play on after winning a free kick from an illegal head high tackle, Caitlyn Edwards slotted East Fremantle’s sixth. Moments later De Melo continued her telling performance with her third major and the Sharks’ seventh. East Fremantle’s Larissa Versace worked hard around each contest, racking up plenty of disposals. Seven goals down with two and a half quarters still to play, Peel needed to find a spark. Pushed off the ball in a marking contest, Kira Phillips won a free kick and kicked the Thunderbirds’ first goal for the afternoon – but this would be their last goal for quite some time. East Fremantle’s game plan was nothing short of unstoppable. Showing strong tackling pressure, the Sharks outnumbered Peel around each contest. Displaying strong skills by foot and effective run and carry across each quarter, the Sharks rarely missed a target and were often too quick for their opponents. Securing a 40-point buffer at the main break, the Sharks could do no wrong. With a neat set shot that travelled strait over the goal umpires head, De Melo slotted her fourth goal to start the third term in style. 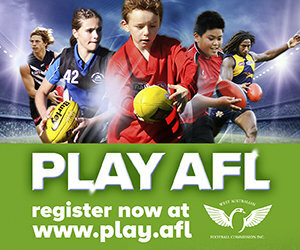 Peel lost Bonnie Mackintosh halfway through the third quarter after she received a heavy knock. Though down for a couple of minutes, Mackintosh bravely returned to play out the rest of the game. A worthy contributor for a best on ground performance, Gabrielle O’Sullivan did the highlights reel plenty of favours when she shrugged off oncoming traffic to kick a stunning goal. Whitney Benson’s gritty performance down back was a real positive for the Thunderbirds. Taking strong defensive marks and contesting the Sharks’ numerous entries inside 50, Benson’s pressure around the footy forbid a much bigger Sharks win. Though far too late for a comeback, the Thunderbirds hit the scoreboard for the first time since the second term with two consecutive final quarter goals from Ebonee Hardie and Bailey Molloy. The Sharks’ dominance, class and poise saw them run out 62 point winners and straight into the grand final, leaving Peel to face Subiaco in an elimination final next weekend. 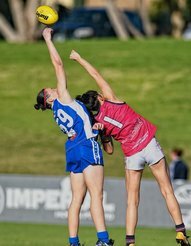 EAST FREMANTLE: Jade De Melo (4), Belinda Smith (2), Kahra Sprlyan (2), Roxanne Roux, Ashlee Atkins, Caitlyn Edwards, Gabrielle O’Sullivan. PEEL THUNDERBIRDS: Kira Phillips, Ebonee Hardie, Bailey Molloy.